The pumpkin invasion is well underway here in New Jersey, and the madness is in full swing. Pumpkins, pumpkins, everywhere! 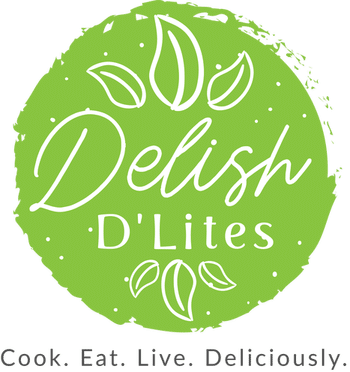 I’m seen everything from pumpkin lattes, to pumpkin cream cheese (DELISH), to pumpkin marshmallows! 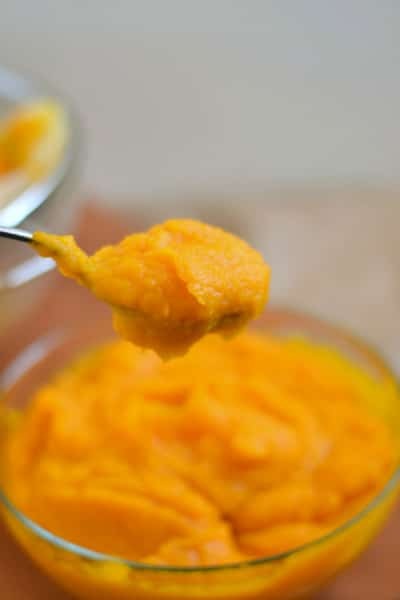 I happen to be obsessed with anything pumpkin related, so in my quest to add pumpkin to everything humanly possible, I decided to start by making a basic homemade pumpkin puree. You can use many different gourds for this recipe. Some of my favorites are small sugar pumpkins, kabocha squash, & butternut squash (most store-bought pumpkin pies are actually made of butternut squash!) So take your pick, and never buy canned pumpkin again! Cut the pumpkin in half, then scoop out the seeds and stringy guts of the pumpkin. 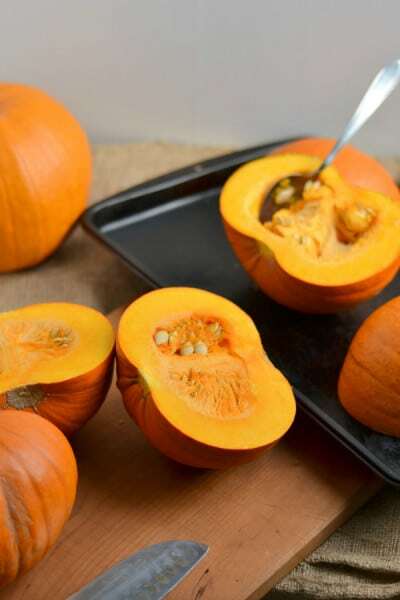 Place the pumpkin halves on a baking sheet skin side down, no oil, no butter, no nothing. Bake your pumpkin for 45-60 minutes, or until fork tender. Your nose will tell you when it’s done. Your kitchen will be filled with the scent of sweet, caramelized pumpkin. 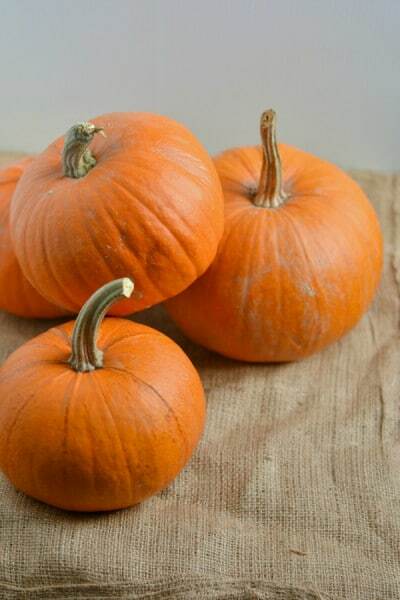 Once the pumpkin is fork tender, remove from the oven, and let them cool for 10-15 minutes. Scoop the tender pumpkin flesh out of the skin, and put it into the food processor. Blend until smooth. 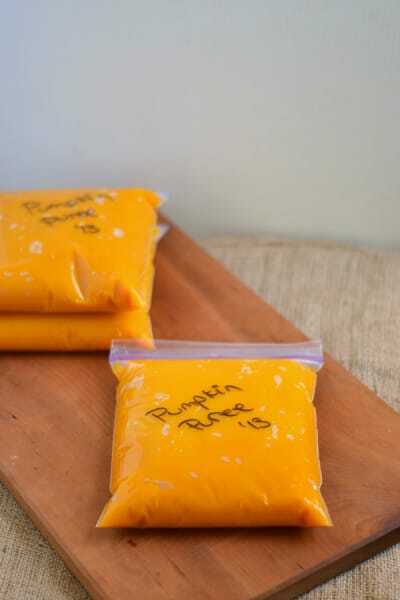 Now depending on the variety of pumpkin you use, you may or may not have to strain the mixture. 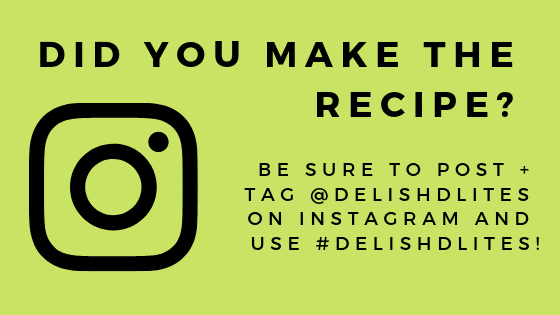 Take a look, if you see a good amount of water in the puree and you’d like to make it more like the stuff that comes in a can, proceed as follows. If not, skip down to the packaging step. Line a fine mesh strainer with a double layer of cheese cloth, and pour into your puree. If you don’t have cheese cloth, use a clean kitchen towel. 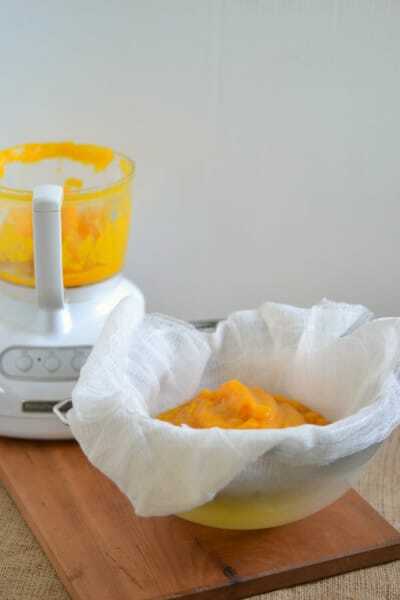 Wrap the puree with your cheesecloth, and allow it to sit & drain for 10-15 minutes. 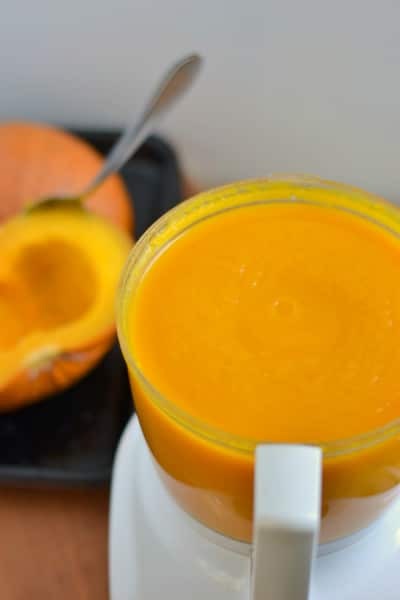 Now you have a perfectly creamy and velvety pumpkin puree! I like freezing 1 cup portions of this stuff in ziptop bags. It’s super convenient and recipe friendly.